Many years ago the AFL-CIO gave Union Station, the big Beaux Arts train station opposite the Capitol in Washington, D.C., a statue of A. Philip Randolph, the great labor and civil rights leader. Randolph organized and was president of the Brotherhood of Sleeping Car Porters, which waged a 10-year battle to win recognition from the Pullman Company. He was also the person who first conceived what eventually became Martin Luther King’s 1963 March on Washington. Randolph’s statue was placed prominently in the Claytor Concourse, an area that just about everyone passes through on the way to an Amtrak train. It was inspirational to see Randolph loom above the mostly white faces of Union Station’s northeast corridor commuters—lobbyists, lawyers, politicians, journalists. You think you’re awfully important, Randolph seemed to say to those below. Let’s see if they ever erect a statue to honor you. I earned my place in history helping to improve the lot of Pullman porters. Who have you helped lately? I spend a lot of time on trains, and at some point I noticed that Randolph had abandoned his position on the concourse, catercorner to the information desk. That’s funny, I thought. Then one day, coming off a train from New York, I headed for the men’s room. Just before I crossed the threshold I did a double-take. There was A. Philip Randolph, pushed unceremoniously into a corner by the loo, as if he were there to dispense towels, like Emil Jannings at the end of F. W. Murnau’s The Last Laugh. It was a disgrace. But as far as I can tell, hardly anyone even noticed. The Washington Post, which last year waxed sentimental about the relocation (to another part of the station) of a long-established mom-and-pop liquor store to make way for Pret-A-Manger, never weighed in on Randolph’s insulting exile. The AFL-CIO did take note, and asked Union Station what was up. It was told that Randolph had been moved during some construction and would eventually be returned to its original site. Eventually, it seems, somebody wised up and moved Randolph back onto the Claytor Concourse, only further down, between a Starbucks and a stationery store. Not ideal, but still on the station’s main passageway, and a lot better than beside a bathroom. TNR interns Meenakshi Krishnan and Lane Kisonak found the statue by Starbucks earlier this week when I dispatched them to Union Station to photograph it. (I thought it was still by the Gents’.) 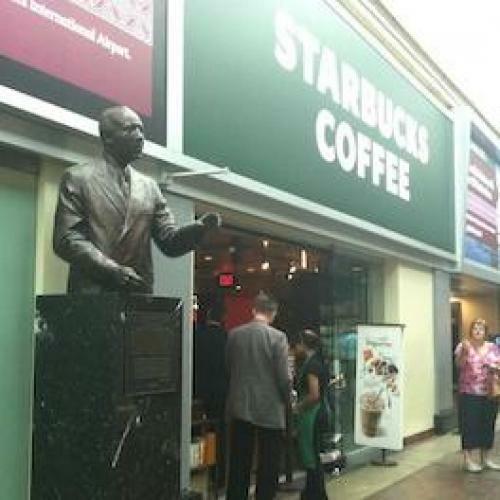 Dawn Banket, Union Station’s director of marketing and tourism, assured me via e-mail that the statue has stood alongside Starbucks since it was moved from its original location nearly four years ago. Not true. I’ve seen it by the can within the past month or so. Krishnan and Kisonak got a different story from a Union Station policeman, one Sgt. Franklin. According to Franklin, the statue really was moved several years ago to Starbucks. But not long ago it was decided that a better, less-cluttered spot would be on a different heavily-travelled concourse by a Barnes & Noble bookstore. But when workers tried to move it there, the statue’s base, which is hollow, started to crack. So instead of moving it all the way over to Barnes & Noble, they moved it to the corner by the men’s room, a little more than halfway from Starbucks. This past weekend the Randolph statue was moved back to Starbucks, where it is now undergoing repairs. This version of events is probably true, but it makes less than perfect sense. If they were going to move the statue from the men’s room, why not put it by Barnes & Noble, which if anything is slightly closer to the men’s room than Starbucks? Best of all would be to move it back where it was four years ago, diagonally across from the information desk. But the main thing, now that Randolph has been rescued from the men’s room, would be to find a decent spot for the statue and leave it there. Randolph has wandered through the station’s marble corridors far too long. Let’s see if we can find the man, if not a promised land, at least a permanent home. Correction, 6/13/12: An earlier version of this post made erroneous reference to the "Clayton" Concourse. It's the "Claytor" Concourse, named for William Graham Claytor, Jr., a onetime Amtrak chief who is better remembered for captaining, during World War II, the first vessel on the scene after the torpedoing of the U.S.S. Indianapolis. The sinking of the Indianapolis was the single biggest at-sea naval disaster in U.S. history (measured by loss of life). Claytor's efforts helped rescue more than 300 of the roughly 1200 men who'd been on board the Indianapolis.